Band Class is an elective that meets everyday during 1st period. It is an extension of the Concert Band. The lesson plan will be rehearsal of the performance material in preparation for upcoming events. All members of the Band Class are required to be in the Evening Concert Band, attend Wednesday after school rehearsals and are bound to the entrance requirements of the Evening Concert Band. Evening Concert Band is open, without audition, to all who play woodwinds, brass, strings and percussion. Those who wish to play Electric Guitar, Bass or Drums are required to play a wind instrument. Students must audition for the Guitar and/or Bass positions. Evening Concert Band plays at the Christmas and Spring Concerts. Other performance opportunities will be announced as they occur. 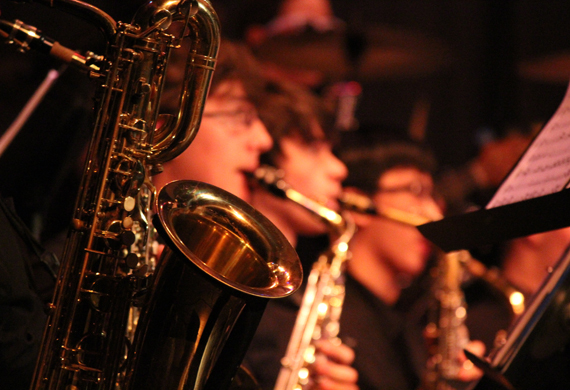 Students may choose to receive extra academic credits for being a member of the Evening Concert Band. Comprised of members from the Evening Concert Band, the Pep Band performs at the home football games, the Powder Puff football game and some pep rallies. Students must audition to perform more advanced material. Members are involved with the concerts, competitions, possibly the Toms River Halloween Parade and various fundraising events throughout the year. Students must audition for open positions to accompany the Show Choir and the Jazz Choir during competitions and performances. Extra rehearsal times will be posted. Students must audition for open positions. These students have the unique opportunity to perform for the Spring Musical. Extra rehearsals and performance times will be posted. Keyboard Ensemble is open to anyone who plays piano, organ or electric keyboards. There will be a placement audition that will take place at the beginning of the school year and is open to non-Concert Band students as well as current members. This ensemble will perform alone and in conjunction with the Concert Band during performances and competitions. This group rehearses during posted FLEX times. Guitar Ensemble is open to anyone who plays electric or acoustic guitar or bass.